OXFORD, Miss. – The University of Mississippi Department of Social Work begins its new Ph.D. program in social welfare this fall, and prospective students are encouraged to apply before the March 1 deadline. Housed within the university’s School of Applied Sciences, the social work department has experienced tremendous growth since 2013. In four years, the department moved up in national rankings while hiring and promoting tenure-track faculty. The new doctoral program is a perfect example of the department’s commitment to higher education, said Javier Boyas, associate professor of social work and director of the program. The UM Department of Social Work continues growing with new doctoral program. “The University of Mississippi has been training social workers for over four decades,” Boyas said. “This new program will provide the most rigorous social work academic training and prepare the next wave of researchers and advanced practitioners. The Board of Trustees of Mississippi Institutions of Higher Learning approved the curriculum for the doctoral program during in November. Students will be required to complete 55 post-master’s credit hours, including 31 hours of core work, 16 hours of research methods and statistics, and 18 hours of dissertation tutorial and dissertation. Courses offered in the program include Topics in Research with At-Risk and Vulnerable Populations, History of Social Welfare and Forensic Social Work. The social work department has offered a bachelor’s degree since 1974 and a master’s degree since 2008. 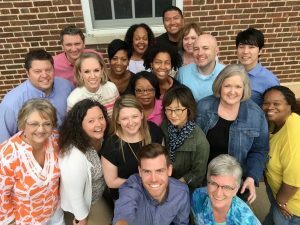 In 2011, the department joined with the Mississippi Department of Child Protection Services to create the UM Child Welfare Training Academy, a 128-hour training curriculum for new caseworkers in the field. Professors with research interests ranging from child welfare to social work technology will lead the new doctoral program. Research papers by the department’s faculty members have appeared in refereed publications such as Social Work, American Journal of Men’s Health, Children and Youth Services Review, Journal of Cancer Research and Clinical Oncology, Environmental Health and Preventive Medicine, Criminology, Justice Quarterly, and Journal of Forensic Social Work. “The growth in the last few years has been unprecedented,” said Daphne Cain, associate professor and chair of social work. “The Ph.D. program in social welfare is an extension of the productive research and educational capacity within our department. The new program reflects the hard work of the department’s faculty and staff, said Velmer Burton, dean of the School of Applied Sciences and professor of social work. Graduate assistantships, which include tuition, a stipend and health insurance, will be available for students who meet the March 1 application deadline. For more information on admission and application guidelines, visit http://sw.olemiss.edu/.